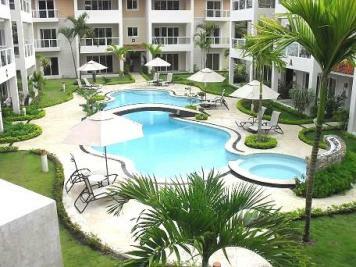 :Rate is per night: New two bedroom condo in a recently built, professionally managed development, located 500 meters from beautiful Cabarete beach and nightlife. Enjoy all the fun that Cabarete has to offer without the noise and pollution of condos located directly on the main road. Air conditioning in both bedrooms, flat screen TV, Cable TV and high speed wirleless internet. 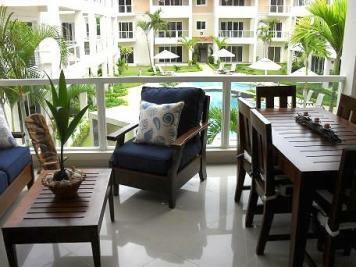 Beautiful balcony with outdoor couch and dining table. All hardwood furniture in unit was hand-made by local Dominican craftsmen. High quality bed linens and towels. Beautifully maintained pool and rain-shower in courtyard. Located only 25 minutes from Puerto Plata International Airport Two quiet restaurants directly across the street offer breakfast and dinner if you do not wish to cook. Washer and dryer located in the unit for convenience. Supermarket is a 5 minute walk from the condo. Property Features: 2 Bedrooms and 2 Bathrooms. King Sized Bed in the master bedroom, AC, living room, plasma TV with cable, high speed wifi internet, 24 hour security. Weekly maid service and a secure parking space is included in the rental fee. Backup power generator. Attractive weekly and monthly rates available! Get ready to enjoy a private, relaxing and comfortable experience in the Caribbean! For more information or photos please contact us.